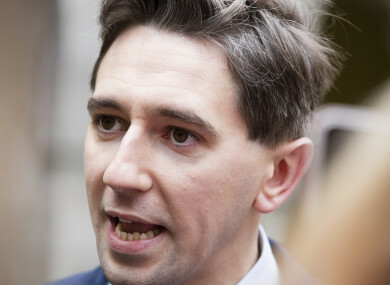 HEALTH MINISTER SIMON Harris has published a memo he received two weeks ago on the cervical cancer scandal. The document states that the case of Vicky Phelan was not a “patient safety incident”. Pressure had been mounting on the minister to publish the correspondence, which contains personal information about Vicky Phelan – the woman at the centre of the CervicalCheck scandal. This afternoon, Independent TD Mattie McGrath called for Minister Harris to resign from his position over the scandal. Vicky Whelan, a Limerick mother-of-two, had a smear test in 2011 where abnormalities were missed. She wasn’t informed until last year despite the information coming to light following a 2014 audit. Last Thursday, 43-year-old Phelan settled a High Court damages claim for €2.5 million over her missed diagnosis. The controversy has been causing shockwaves since last week. A redacted version of the memo has now been published. The document states that the National Screening Service and the head of the National Cancer Control Programme advised the Department of Health in writing that they “do not consider this to be a patient safety incident but rather a reflection of the known limitations of the current screening test”. It also informs the minister that the National Screening Service “assured the Department that no quality issues have arisen in relation to the US laboratory which performed the 2011 test”. The document states that the State Claims Agency believed there would be significant media coverage of the case, and a suggested quote to the media from Minister Harris is included in the memo. The suggested quote acknowledges the “severe distress” that the matter must have caused Phelan and her family. The appendix of the memo also discusses the CervicalCheck audit which took place. It states that in 2015 a decision was taken by the HSE, “in line with international best practise, to provide information on outcomes of clinical cancer audits to treating clinicians for onward communication to patients as appropriate”. The outcomes of all current and historical clinical cancer audits were subsequently communicated to treating clinicians in 2016 (including this case). More recently, women are informed of this audit process and they have the option to request information on the outcomes of these reviews, which are sent to the treating doctor for discussion with the patient. This is the note that opposition TDs, such as Fianna Fáil’s Stephen Donnelly, state jar with the facts of the case, insofar as while clinicians may have been informed, the women affected were not informed directly. Donnelly says that it raises questions about who knew what when. He said the minister needed to be transparent about what he and his department knew. Labour’s Health Spokesperson Alan Kelly said questions need to be answered by all involved in the cases over the years – including former health ministers Leo Varadkar and Mary Harney (who was health minister at the time CervicalCheck was rolled out). He said the national cancer control programme and the testing laboratories also have questions to answer. Earlier today, Sinn Féin Leader Mary Lou McDonald said the HSE boss, Tony O’Brien, who is due to retire in the coming months, should resign or be sacked. Speaking on RTÉ’s Today with Sean O’Rourke programme, O’Brien has said that he first learned of the entirety of Phelan’s case through the media last week. He added that he never once considered resigning over the CervicalCheck scandal. O’Brien said it is vital that women continue to get a smear test every three years. However he stressed the test is not a diagnostic test but a screening one and there is no laboratory in the world that can provide 100% accuracy on that type of cytology. “The reality is that the cytology test is not 100% effective, it has a level of assurance which is well below 100%. All of the literature, all of the information given to anyone who uses the CervicalCheck programme makes it clear and the term that’s often used about women getting the all clear, no one gets the all clear, either an abnormality is detected or it’s not,” he said. He said that Professor Grainne Flannelly, former Clinical Director of Cervical Check, who stepped down from her role over the weekend, gave explanations during a radio interview last week. “She was telling the truth that while she had engaged in a process which sought to have women informed, there was a missing link in that process. In that the central programme office did not have verification that individual women had been provided with that information,” said O’Brien. In total, the probe carried out by the HSE’s Serious Incident Management Team has found that, of the 208 cervical smear result cases being scrutinised, only 46 women were told about the history of their smear tests. The HSE has confirmed that 17 women whose cases were reviewed as part of an audit into the scheme have died. In a statement last night, Harris confirmed that a Hiqa investigation will take place into CervicalCheck, which will place a “particular focus on the quality assurance systems, clinic audit processes and the communications with patients”. Harris has written to Hiqa asking it to undertake the statutory investigation. The HSE has also established a helpline so women can seek information themselves. Email “Cervical cancer memo to minister states Vicky Phelan case was not a patient safety incident”. Feedback on “Cervical cancer memo to minister states Vicky Phelan case was not a patient safety incident”.